Rotating your tires involves systematically changing your tires’ position on your vehicle from front to back and/or side to side. It’s important to stay on top of getting your wheels rotated when needed because of a tire rotation’s ability to provide unique performance advantages. Rotating your wheels acts as a preventative maintenance that will properly balance out side-to-side and front-to-rear wear rates. Also, when you rotate your tires on time, your vehicle’s handling and traction will stay balanced for a longer period of time. Front-wheel drive (FWD) vehicles put a lot of demand on your front tires as they accelerate, steer and help your vehicle come to a complete stop. So, naturally, they will wear down faster than your rear tires, which will typically last twice as long as your front-wheel tires. Having your tires rotated frequently will assist with evening out the wear-and-tear by letting each wheel serve in as many of your vehicle’s wheel positions as possible. How often should you have your tires rotated? First, it’s important to make sure your wheels are being serviced periodically, regardless of whether or not they’re also rotated at that time. Ultimately, you can learn more about you car’s rotation patterns in the owner’s manual, however, we recommend you have your wheels rotated every 4,000 to 6,000 miles – every six months – even if your tires aren’t showing signs of wear. And, ideally, you should replace all four tires at the same time. Tire alignment, or wheel alignment, is necessary once your vehicle begins to show signs of misalignment, such as pulling to one side or the other, uneven tire wear, or having a crooked steering wheel when you’re driving straight. Curious how much a tire rotation will cost? At KB Tire & Auto, we always strive to bring you the most competitive prices in mid-Missouri. We charge $25 for tire rotations, but we offer free tire rotations if you buy your tires from us. When you buy four new tires from us, you get free rotation, balance and flat repair for life on tires wiht purchase of road hazard. Scheduling your tires to be rotated at your dealership is often more expensive compared to visiting an independently-owned shop. At KB Tire & Auto, our operation aims for the best in quality of auto services and customer service. Our in-depth, detailed tire rotations extend past a simple tire rotation. 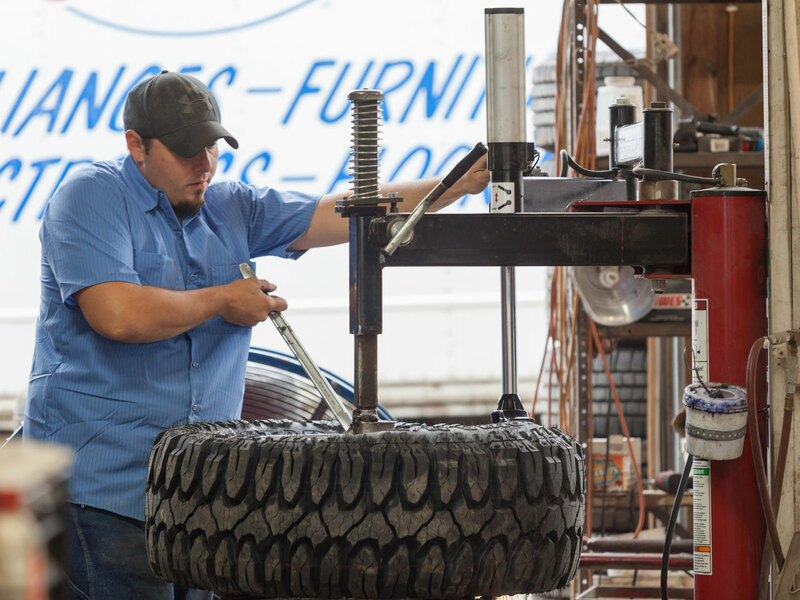 We check every tire for any other signs of tire damage. Our trained team will also make sure that your tires are properly aired. Whether you’re wanting a simple oil change or your transmission fixed, we put a high priority in properly diagnosing problems with your vehicle like it was one of our own vehicles. We are stationed out of Moberly, MO, and we proudly serve Moberly and the surrounding mid-MO communities. If you have any questions about our services or want to get a quote, contact us today! Call or send us an email. We’ll have you back on the road, “rotated and ready” in no time.